When Pat Brennan took a job at Ottawa's Union Mission, he expected the work to be demanding, stressful and tiring. He didn't think it would be dangerous, too. "Working at the Mission is like going into a jail, where there are no rules, where the inmates go in and out as they please, where you have no defensive weapons and you're just there," he says. 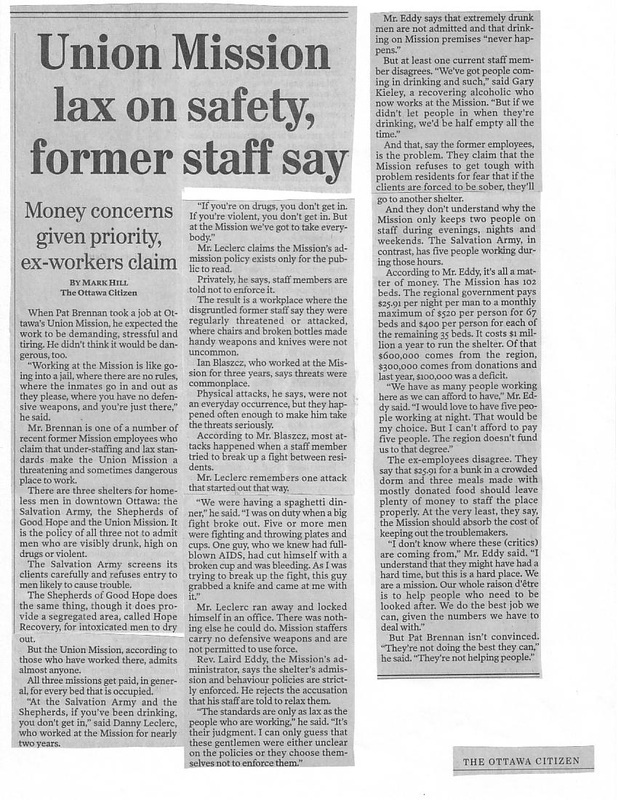 Mr. Brennan is one of a number of recent former Mission employees who claim that under-staffing and lax standards make the Union Mission a threatening and sometimes dangerous place to work. There are three shelters for homeless men in downtown Ottawa: the Salvation Army, the Shepherds of Good Hope and the Union Mission. It is the policy of all three not to admit men who are visibly drunk, high on drugs or violent. The Salvation Army screens its clients carefully and refuses entry to men likely to cause trouble. The Shepherds of Good Hope does the same thing, though it does provide a segregated area, called Hope Recovery, for intoxicated men to dry out. 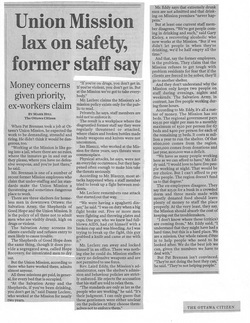 But the Union Mission, according to those who have worked there, admits almost anyone. All three missions are paid for every bed that is occupied. "At the Salvation Army and the Shepherds, if you've been drinking, you don't get in," says Danny Leclerc, who worked at the Mission for nearly two years. "If you're on drugs, you don't get in. If you're violent, you don't get in. But at the Mission we've got to take everybody." Mr. Leclerc claims the Mission's admissions policy exists only for the public to read. Privately, he says, staff members are told not to enforce it. The result is a workplace where disgruntled former staff say they were regularly threatened or attacked, where chairs and broken bottles made handy weapons and knives were not uncommon. Ian Blaszcz, who worked at the Mission for three years, says threats were commonplace. Physical attacks, he says, were not an everyday occurrence, but they happened often enough to make him take the threats seriously. According to Mr. Blaszcz, most attacks happened when a staff member tried to break up a fight between residents. Mr. Leclerc remembers one attack that started put that way. "We were having a spaghetti dinner," he said. "I was on duty when a big fight broke out. Five or more men were fighting and throwing plates and cups. One guy, who we knew had full-blown AIDS, had cut himself with a broken cup and was bleeding. As I was trying to break up the fight, this guy grabbed a knife and came at me with it." Mr. Leclerc ran away and locked himself in an office. There was nothing else he could do. Mission staffers carry no defensive weapons and are not permitted to use force. Rev. Laird Eddy, the Mission's administrator, says the, shelter's admission and behaviour policies are strictly enforced. He rejects the accusation that his staff are told to relax them. "The standards are only as lax as the people who are working," he says. "It's their judgment. I can only guess that these gentlemen were either unclear on the policies or they choose themselves not to enforce them." Mr. Eddy says that extremely drunk men are not admitted and that drinking on Mission premises "never happens." But at least one current staff member disagrees, "We've got people coming in drinking and such," says Garry Kieley, a recovering alcoholic who now works at the Mission. "But if we didn't let people in when they're drinking, we'd be half empty all the time." And that, say the former employees, is the problem. They claim that the Mission refuses to get tough with problem residents for fear that if clients are forced to be sober, they'll go to another shelter. And they don't understand why the Mission keeps just two people on staff during evenings, nights and weekends. The Salvation Army, in contrast, has five people working during those hours. According to Mr. Eddy, it's all a matter of money. The Mission has 102 beds. The regional government pays $25.91 per night per man to a monthly maximum of $520 per person for 67 beds and $400 per person for each of the remaining 35 beds. It costs $1-million a year to run the shelter. Of that $660,000 comes from the region, $300,000 comes from donations and last year $100,000 was a deficit. "We have as many people working here as we can afford to have," Mr. Eddy says. "I would love to have five people working at night. That would be my choice. But I can't afford to pay five people. The region doesn't fund us to that degree." The ex-employees disagree. They say that $25.91 for a bunk in a crowded dorm and three meals made with mostly donated food should leave plenty of money to staff the place properly. At the very least, they say, the Mission should absorb the cost of keeping out the troublemakers. "I don't know where these [critics] are coming from," Mr. Eddy says. "I understand that they might have had a hard time, but this is a hard place. We are a mission. Our whole raison d'être is to help people who need to be looked after. We do the best job we can, given the numbers we have to deal with." But Pat Brennan isn't convinced "They're not doing the best they can," he says. "They're not helping people at all."